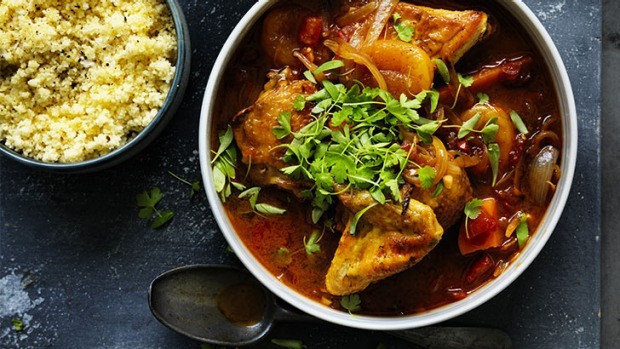 Adam Liaw's beginner's chicken tagine. Love Middle Eastern flavours? I always think the best way to start exploring a new cuisine is just to make things you like to eat. A tagine that's a bit like Mum's apricot chicken is a perfect example. Authenticity is overrated. You don't even need a fancy clay pot to make this tagine. A good, deep frying pan with a lid will work just as well. 1. Cut the chicken into 8 pieces on the bone and rub all over with the salt. 2. Heat the olive oil in a tagine or large, lidded frying pan over medium-high heat and fry the chicken until well browned. Remove from the pan. 3. Add the onions, garlic and ginger and fry until fragrant. Then add the cumin, paprika, cinnamon, mango chutney, apricots, tomatoes, sweet potato and chicken stock and bring to a simmer. 4. Return the chicken to the liquid, cover and simmer for 30 minutes. Adjust for seasoning. 5. Allow to rest for 10 minutes, then scatter with the parsley and coriander and serve with couscous. Adam's tip: Sweet mint tea is a perfect match for a meal like this. Just brew some strong green tea (like a Japanese Sencha) and add a good handful of mint leaves and a few spoons of white sugar.